Pasta is one of those things that I struggle with on Weight Watchers. It always seems so high in points that I have a difficult time justifying having it with a meal. The solution for me is quite often using zucchini noodles. But this delicious rustic vegetable pasta is just as wonderful. The trick is to use whole grain pasta. It’s much higher in fiber than regular durum wheat pasta, which makes it fewer points. Topping the pasta with grilled and seasoned vegetables means that it’s filling without adding a lot more points. Grilling the vegetables adds a delicious flavor as well as making the vegetables look beautiful. The lemon juice and Italian seasoning add light and delicious flavor, especially when they’re paired with the balsamic seasoned vegetables. Adding lemon juice (or lime juice) to vegetables makes them bright and beautiful. 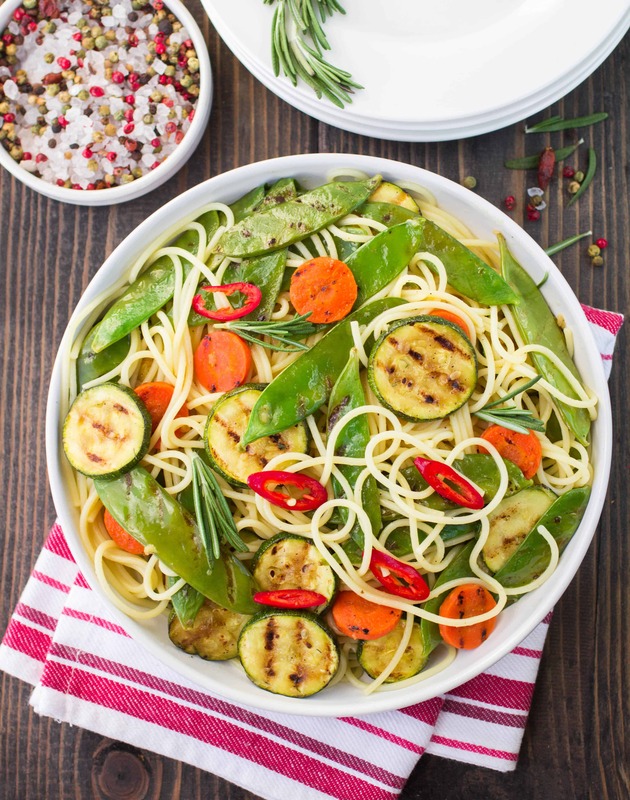 Nutritious and delicious whole grain pasta served with grilled vegetables. The whole dish is seasoned with Italian seasoning and balsamic vinegar. The lemon juice helps to keep the vegetables bright and beautiful while adding a refreshing summery flavor. Cook pasta according to package direction. Mix together the oil, vinegar, zucchini, carrots and peppers. Mix to toss well. Grill for 5 – 10 minutes, or until the vegetables begin to become tender. Add the sugar snap pea pods and grill for 1 minute. Mix together the vegetables, spaghetti, lemon juice and seasonings. Serve warm.